Heya, everyone! 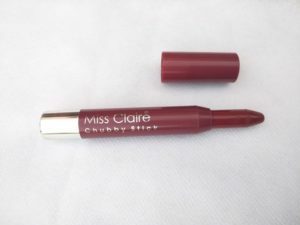 I know everyone is already really excited to read this post about “Miss Claire Chubby Lip Stick Review” since this shade is very popular and suits the Indian complexion very much 🙂 Miss Claire Lipsticks have always been varied and have served with great quality. As per the female mentality, we always select the product which gives the best quality for its price. 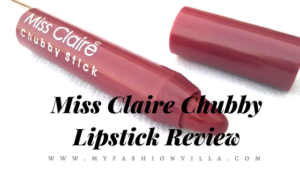 I have not used any of Miss Claire’s products before but when I got to know about its collection I was really impressed. Providing a great quality, these lipsticks are also affordable. 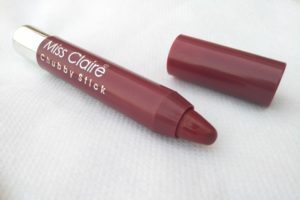 There is a huge variety of makeup products by this brand such as Miss Claire Lipsticks, Miss Claire lip creams, Miss Claire foundation, Miss Claire eyeshadow, Miss Claire primer, Miss Claire highlighter and many more. 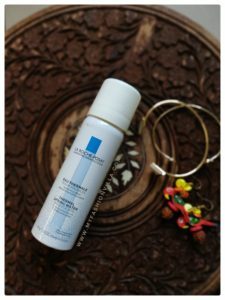 It is a Drugstore brand, mainly available in India only. Their products are available online and offline both. Talking about the packaging, it does a wonderful job. A sleek dark red cylindrical container with opaque cap. It has a reflective silver bottom which works as a twister. 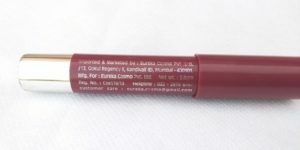 The brand name and details about price, shade, and ingredients are neatly mentioned on the lipstick. It looks like a thick crayon stick. It has a deep(dark) red matte shade which becomes pretty catchy if applied perfectly 😉 Its texture and color are incredibly smooth and deep. It is around 3-4 inches big yet lightweight and easy to carry. The thing which I liked most about this is, it very easy and soft to apply. Many lipsticks go sticky and greasy with the application but this was totally amazing! Plus, it does not have any strong fragrance, just a neutral smell. Price – It varies on different online shops. 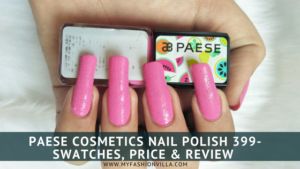 Available on Nykaa.com purplle.com and Amazon.in as of now. Well, I truly love this lipstick! 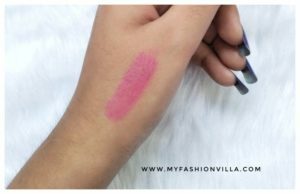 I have tried numerous kinds of lipsticks and this is one of my favorites! Firstly, as I mentioned, it has pretty sturdy packaging, which protects it from accidents and…..we know the pain of losing a favorite lipstick. The normal rotate function works well. The shade is of deep red with a bit of darkness. It is totally matte. 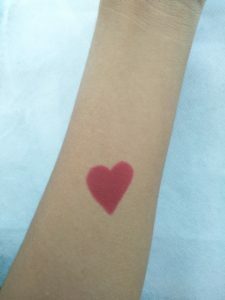 It glides easily on the lips and gives total opaque finish in just one swatch<3 Talking about the staying power, it is reasonably fine. It stays for about 4-5 hours without any issues. Further, it doesn’t make your lips look dry or patchy, instead, it moisturizes the lips. The point I am disappointed with is, it is transferable. The moment you eat or sip a drink, it is transferred a bit on the glass. But as long as the shade, texture, and finish are concerned, I would definitely go for re-purchase!! 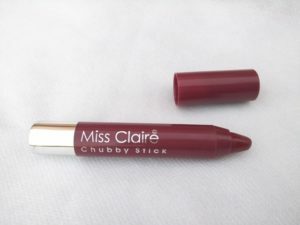 Well, with this Miss Claire Chubby Stick, I would say, I am satisfied. The swatch in the image above might appear light, but it is bit dark in real. If you are a fan of red lipsticks, then you need to get this one ASAP! We’ll be back with another interesting review soon! Till then, stay slaying!